This CV, you may notice, is not much like the black-and-white stacks of paper you nor­mally see. It just seems disin­gen­u­ous to do it the old-fashioned way when I pro­fess to be all about the new cross-platform con­tent. So, I’ll try to be a lit­tle more enter­tain­ing in my pre­sen­ta­tion. Really, mak­ing all of this was fun for me, so why should review­ing it bore you to tears? And yes, I am a geek. I used the blog site as a project for a con­tent design and cura­tion class. Wire­fram­ing, User Expe­ri­ence, and back-end devel­op­ment were the focus there, as they applied to cre­at­ing a port­fo­lio or project site. This is my final project plan for the logistikat.com blog. The Fun­nel Study–What did I learn here? That I really quite like sta­tis­tics! Our sur­vey instru­ment didn’t receive enough com­ple­tions to actu­ally glean any rel­e­vant infor­ma­tion, which was dis­heart­en­ing, but the process and the sub­ject mat­ter were tons of fun, and my study part­ners were the best EVAR. View more pre­sen­ta­tions from logis­tikat. As an under­grad, I was accepted to present at the ACA/PCA national con­fer­ence in St. Louis in 2010. My paper, “Sheep in Wolves Cloth­ing” was an analy­sis of the ideal and the real­ity of the “strong woman” in the books of one par­tic­u­lar para­nor­mal romance author. This paper gained me the notice of Drs. Eric Selinger and Sarah Frantz, the founders of the Inter­na­tional Asso­ci­a­tion for the Study of Pop­u­lar Romance (IASPR). I have since been a mem­ber and copy­ed­i­tor of the Association’s sis­ter Jour­nal of Pop­u­lar Romance Stud­ies. Com­ing from that work, I pre­sented a paper at McDaniel College’s “Pop­u­lar Romance in the New Mil­le­nium: An Inter­na­tional Con­fer­ence.” This paper stud­ies the the growth of niche acad­e­mia, using IASPR as an exam­ple, and net­work and inno­va­tion the­o­ries as a basis for my thesis. As an inde­pen­dent study class, I built a web­site for a real-world client, Evil Slave, LLC. They are a new local film pro­duc­tion com­pany on the rise, and wanted a web­site to pro­mote their work, and also reflect their irrev­er­ent style. Here is my Pre­lim­i­nary analy­sis for the Evil-Slave.com web­site. 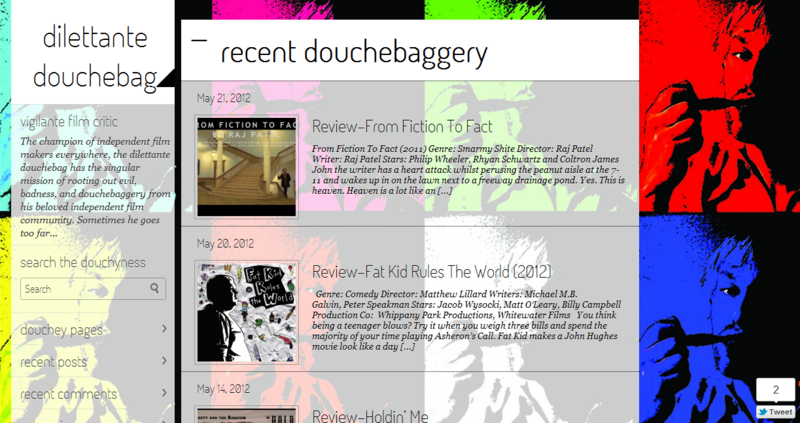 From that project came another: one of the prin­ci­pals of Evil Slave, Ben James, has a film review blog, called DilettanteDouchebag.com. I’d helped him set up a bare-bones Word­Press blog two weeks before my “Nar­ra­tives and Net­works” class ended, and it went big, fast. So, Ben hired me to assist him with devel­op­ing a brand and web­site that is in keep­ing with his pre­ten­tious douchebag persona. Com­ing soon: the orig­i­nal LogistiKat–a review of 3-D movie trail­ers, coded in HTML, PHP, and CSS.